It started off as a small issue. My 3 year old Razer Mamba’s (2012 edition) internal battery died. It wouldn’t charge regardless of what I plugged it into. Seeing that the mouse was pretty old and my warranty has long expired, I’ve decided to just continue using it as a wired mouse. It was all nice and good until one fine day the mouse decided to totally break down. So much for that. Luckily for me, there was a PC fair going on and I picked the Logitech G700s wireless gaming mouse, abandoning my long term determination that “I will only use Razer mouse”. Originally my first choice was the G602 (it was cheaper than the G700s) but as luck would have it, the Logitech stall ran out of the stock for that particular model. Determined not to return home empty handed, I told the helpful sales girl I wanted a G700s and made my way to the payment counter. I wouldn’t go into much detail on the tech specs and features of this mouse but basically it’s a rechargeable wireless gaming mouse with 13 programmable buttons, to which all of them can be accessed with just your thumb and index finger. It uses a small USB dongle that runs at 2.4Ghz frequency. Logitech’s spec sheet stats that the mouse maintains a consistent 1 ms response rate regardless if it’s on wireless or wired mode. Pretty impressive. After using the mouse for over a month, I can honestly say that I’m happy with the Logitech G700s. The overall size and weight feels just right for my hand and I didn’t noticed any delays in my movements while playing Counter-Strike: Go. Battery life was significantly shorter compared to Mamba but the two things that I really like about the G700s are the ability to change the internal battery and use any kind of micro USB cable. For starters, while Mamba and G700s both uses micro USB cable for charging and wired mode, the Mamba has some kind of proprietary head which only Razer’s own USB cable will be able to fit in, unless you can find a cable that’s smaller and thinner than Razer’s. As for the battery, the G700s uses a Eneloop AA 300mAH rechargeable battery that can be found in most hardware stores, making it much easier to replace compared to the Mamba. Now, I’m not saying that the Mamba is a bad mouse just because it uses proprietary battery and USB head. As a matter of fact, it’s a very good gaming mouse to which I enjoyed using throughout these 3 years. However at this point of time, I was looking a wireless gaming mouse with the ‘budget’ factor in mind, with the added ability to change the internal battery easily. 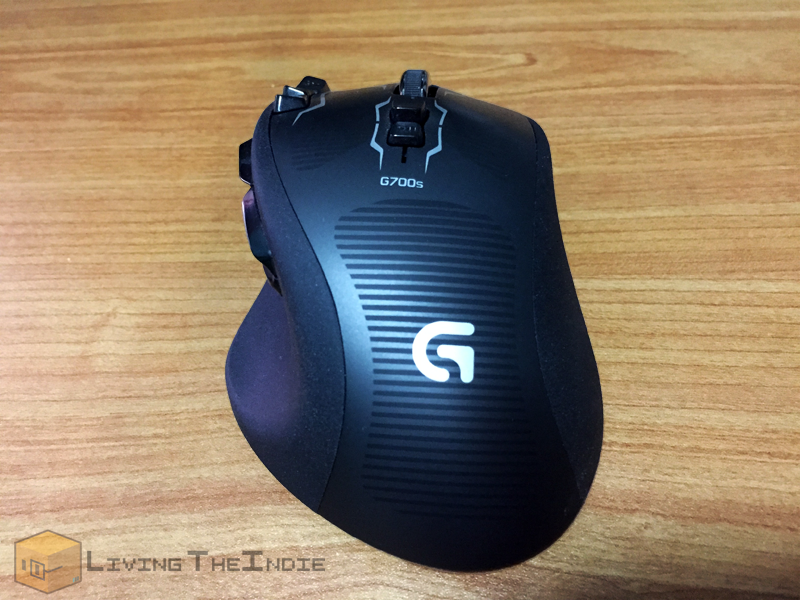 The Logitech G602 fits my requirements perfectly but due to unforeseen circumstances, I had to go with the G700s. So far all I have talked about are the good points of the G700s. What about the bad points? The only main complain I have with the mouse is the slightly weird texture that’s along the side of the mouse. It provides better grip but it feels too rough for my taste. Not much of a deal breaker as I don’t really notice it while gaming. Battery life could have been better as well. All in all, it’s a good gaming mouse. No doubt you can get a much better wired gaming mouse for the same amount of money but hey, wireless mode was my number 1 priority so that’s that. If you are looking to buy the Logitech G700s or anything else for that matter on Amazon, we hope that you will use our affiliate link below. Each time you buy something from there, we get a small kickback and it helps us out a bunch. Thanks and happy gaming!